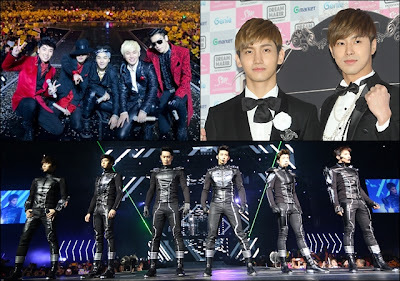 MANILA, Philippines - Korean boy bands 2PM, Big Bang and TVXQ have received nominations in the 2013 MTV Video Music Awards Japan (VMAJ). MTV Japan announced the nominees, the hosts and the first three performers of the awards ceremony, which will be held on June 22 at Makuhari Messe in Chiba Prefecture, Japan. Carly Rae Jepsen, indie rock band Imagine Dragons and J-pop star Kana Nishino will perform at the VMAJ, which will be hosted by Nobuaki Kaneko and Atsuko Maeda. 2PM's "Legend of 2PM," released last February, has been nominated for Best Album of the Year. The boy band will compete in the category against Carly Rae Jepsen's "Kiss," One Direction's "Take Me Home," Linkin Park's "Living Things" and Kana Nishino's "Love Place." The Korean boy band will be making their comeback to the K-pop scene with a new album in May. Big Bang bagged the nomination for Best Dance Video for "Fantastic Baby." The other nominees are Group_inou's "9," Livetune adding Megumi Nakajima's "Transfer," Skrillex's "Bangarang" and Zedd's "Spectrum" (featuring Matthew Koma). TVXQ's "Catch Me-If You Wanna" is nominated for Best Group Video along with Fun. 's "We Are Young" (featuring Janelle Monae), Maroon 5's Payphone (featuring Wiz Khalifa), One Direction's "What Makes You Beautiful" and J Soul Brothers III's "Hanabi." Bruno Mars, Fun., One Direction, Taylor Swift and Kana Nishino received three nominations each. According to MTV Japan, fans can vote in all 16 categories on the MTV Japan official Facebook page until 5PM of June 11. It said MTV VMAJ 2013 will be broadcast worldwide on MTV channels, with potential viewership expected to reach over half-billion households. TVXQ (aka TOHOSHINKI) - “Catch Me -If You Wanna"
ADELE - “Skyfall (Lyric Video)” from "Skyfall"
FLORENCE + THE MACHINE - “Breath of Life” from "Snow White and the Huntsman"
Mr.Children - “Inori ~Namida no kidou” from "Bokura ga Ita Zenpen"
ONE OK ROCK - “The Beginning” from "Rurouni Kenshin"
PITBULL - “Back in Time (featured in "MEN IN BLACK III")” from "Men in Black 3"